Oban is popular as the “Gateway to the Isles” on the west coast of Scotland. 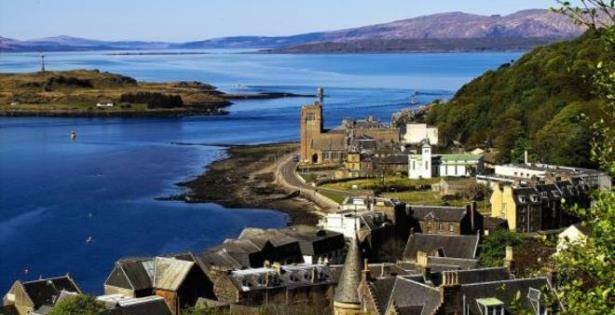 Originally a settlement that grew around a distillery built in 1794, Oban, which occupies a crescent bay sheltered by the island of Kerrera, is today a busy hub of summer vacationers who head out to the outlying islands or explore the region of northern Argyll. From the bustling core of downtown where you can find varying types of hotel accommodation in Oban, Scotland, you can hop on a ferry plying the waters of the Firth of Lorn to the Inner Hebrides to see a unique collection of islands that are as varied in their character as in their geography. Easily popular, especially among mountaineers and hikers, are the islands of Mull and Skye whose highest points – each taller than 900 meters above sea level – offer spectacular vantage points. While the town’s waterfront is lined with a tiara of hotels in Oban, Scotland, its marina is not in the mainland itself but on the island right in front of it. Kerrera hosts a 200-berth waterfront, and directly linked to the mainland by passenger ferry. Other popular islands that can easily be stitched into a daytrip include Coll where beachgoers take full advantage of its sandy beaches in a sparsely populated setting. Tiree, a low-lying island with slightly more residents engaged in fishing and farming large tracts of fertile land is an ideal foodie destination particularly for those who love lobsters, langoustines and crabs. As the most westerly island of the Inner Hebrides, it is both the sunniest and windiest, making it a hotspot for avid windsurfers. Back to your bed and breakfast in Oban Scotland, Oban Distillery, which predates the founding of the town, is five-minute walk from the center of the town. It is not only renowned as one of the oldest in Scotland but also for its rare 32-year-old and 18-year-old editions of single malt Scotch whisky, an excellent introduction to North Argyll’s Whisky Trail which includes the islands of Jura and Islay, the latter with more than its fair share of distilleries. Oban’s Dunollie Castle is also the starting point of castle tours which include the islands of Coll, Eilean Donan and Rum. Farther inland from bay-facing Oban is the loch-dotted wilderness of Argyll crisscrossed with well-paved hiking and biking trails strewn with castles, galleries, museums, and as one of the earliest settlement of the Picts, historic sites. While Argyll’s woodlands and open grasslands and rugged coasts invite contemplation, the 9th century abbey in the island of Iona – otherwise known as the final resting place of several Scottish monarchs – is a highly visited pilgrimage site and a fitting place to ponder the beauty of Scotland’s west coast.